· A target area not yet explored with modern prospecting methods. · Availability of a large coherent tract of ground without title risk. Alkalic igneous rocks, well-documented for their association with gold mineralisation, are relatively rare on a global scale, but well-known in British Columbia, where they are true-to-type, and host well-known gold-rich porphyry deposits such as Afton, Mt Polley, Galore Creek, and Mt Milligan. Outside of British Columbia, alkalic igneous rocks are the hosts to, or generators of, such renowned deposits as Porgera and Ok Tedi in Papua New Guinea and Emperor in Fiji, as well as lesser-known but nevertheless compelling mines such as Cadia in Australia and Cripple Creek in the United States. Many modern prospecting technologies have been specially developed to cover large exploration areas quickly, with a view to selecting much smaller areas for detailed follow-up exploration. However two factors have discouraged exploration companies from using these technologies in British Columbia - the high cost of ground acquisition in the province, together with a negative attitude towards minerals exploration on the part of the provincial government during the 1990s. Both these factors have now changed – creating ideal circumstances for significant discoveries to be made by the first parties to deploy these technologies in the right target areas. (2) Helicopter-borne magnetic and radiometric survey. 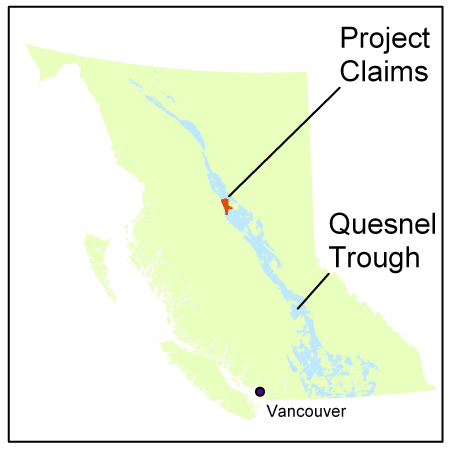 One of the consequences of the historically high cost of staking in BC is that ground is held in an irregular patchwork of relatively small claims, mostly centred around known mines and mineral occurrences. The modern regional exploration technologies mentioned above are, on the other hand, ideally deployed over large coherent tracts of ground that have been secured by the explorer in one form or another, albeit for a relatively short period of time (usually by a reconnaissance licence in other parts of the world). An essential element of the opportunity created by Redton Resources Inc. in acquiring its Quesnel Trough property is its areal extent, which makes possible the deployment of these modern regional exploration technologies.